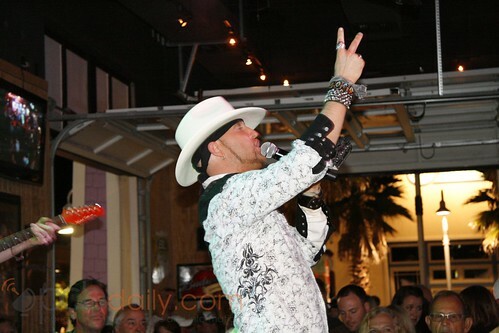 If you were following my Tweets Saturday night, then you know I was at Tootsies Orchid Lounge in Pier Park in Panama City Beach covering the LoCash Cowboys performing live, and boy were they awesome – tons of energy and talent. They came by in promotion of their appearance in BamaJam and in promotion of the event as a whole. BamaJam will actually feature Kid Rock, Brooks and Dunn, Alan Jackson, The Black Crowes, Taylor Swift and tons of other big names. With their huge fancy looking tour bus parked on the sidewalk they performed with all their hand and head accesories shining in the stage lights. The dance floor was packed with old and young alike getting their groove on and enjoying the live music. One old guy was playing the “air” fiddle with his cane on his arm. Welcomed by “Preston,” one of the lead singers, he signaled his violinist to play a solo in encouragement of the crowd’s enthusiasm. The LoCash Cowboys put on a very energetic performance that included boisterous movements all over the stage. I actually quite enjoyed it, even though I’m not a huge country music fan. Next Post Horses, Beach & Food…Oh My!